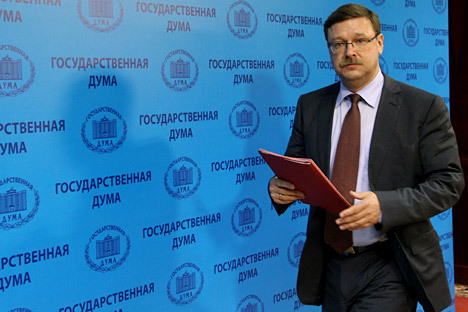 Federation Council International Affairs Committee Chairman Konstantin Kosachev has called absurd the statement by U.S. Defense Secretary Ashton Carter about the possibility of a long period of confrontation with Russia. There is an apparent inconsistency in Carter's statement, Kosachev wrote in his blog on Monday. In the opinion of Carter, Russia cannot change during the period of Vladimir Putin's office and even after he is gone and they should prepare for a long confrontation. "Interestingly, Carter expressed hope for Russia's return to a 'farsighted' course and 'a predictable policy', and this is an obvious inconsistency," Kosachev wrote. "In my opinion, there is an obvious inconsistency between the two phrases: on one hand, the politician is positive that Russia cannot change, but this is nothing less but predictably, although it may not be convenient to some. On the other hand, he would like Russia to go back to 'a predictable policy'. From the point of view of normal logic, this is obviously absurd," the parliamentarian said. But every piece falls in its place if one takes for granted that the Pentagon understands as 'predictability' 'a behavior predictably obedient to Washington', he said. "Did it come as a surprise to Washington or its European partners that Moscow would inevitably react to their attempt to draw Ukraine into the Euro-Atlantic orbit? Was it difficult to forecast that Russia would react differently from Washington or Brussels to the February coup and its consequences, from Odessa to the bloody 'ATO' in Donbas?" he said. "All those things were said many times on the supreme level, and warnings were given back in fall 2013 about consequences of the Ukraine-EU Association Agreement. We have been speaking about the categorical impermissibility of giving Ukraine the 'either or' choice for more than a decade," Kosachev said. Everything Russia was talking about has come true as expected, he said. "Now the Americans are surprised [as to] why it is our forecasts and not theirs that have come true. If the United States was expecting Russia to stay aside amid the blatant interference of the Americans in Maidan and the consequent use of force against Russians in eastern Ukraine, it is the fault of the United States and not Russia that this forecast did not come true," Kosachev said. "What kind of 'predictable' behavior should Russia go back to? Is it that they will do whatever they want and Russia will not interfere? If someone has not realized that, this formula came to an end on February 21, 2014," the committee chairman said.